I had been living in DC for about 6 months before I truly felt like a “DC-er”. No, it wasn’t participating in a rally, or campaigning for a politician I really stood behind. It wasn’t after I took my first walk around the Reservoir during cherry blossom week (though that was pretty phenomenal), or the first time I drove home from Arlington without a GPS telling me which turn to take (and knowing when Rock Creek Parkway would be the best route). Nope. The moment I felt at home here was when I bought my first print of Mount Pleasant (where I live) by Cherry Blossom Collective, found a frame and hung it proudly on the wall of my 7-person group house. Though we don’t carry the neighborhood prints at Pleasant Pops (aside from the one displayed on our wall), we are excited to sell beautiful greeting cards by one artist in Cherry Blossom Collective, Marcella Kriebel. As an artist proficient in a number of mediums, Marcella combines her passions for illustration, watercolor, cooking and eduction in all the work she does. In addition to the colorful and creative prints and cards she sells at craft fairs and stores, Marcella has written and illustrated an amazing cookbook,Comida Latina, which has received recognition both for it’s delicious recipes and for it’s uniquely beautiful flare. Though her prints span many worlds, from herbs and plants, to seafood delicacies, all the way to recipes for brownies, we have elected to keep with the Pleasant Pops theme and go strictly vegetarian. The greeting cards we carry include: Brassica (all those leafy greens we know we need to eat more of), Peppers (from Poblano to Thai Chile to Jalapeño and everything in between), Rosaceae (with the juiciest, summertime fruits we excitedly pluck from trees) and Apiaceae (the heartiest carrots, celery and fennel). With blank interiors, these cards are excellent for any occasion. Before we opened the storefront in 2012, we were lucky enough to partner with Fire Studio, a local DC company which designs, prints and manufactures original art. 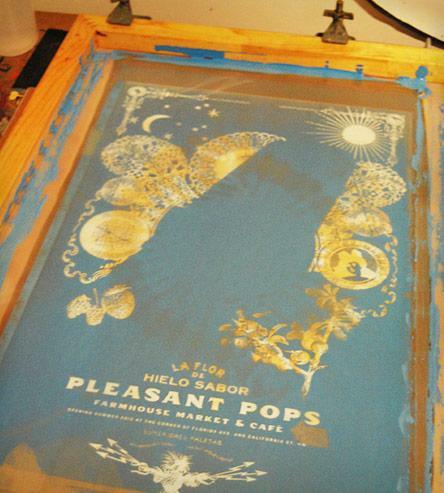 Anthony Dihle, the artist behind Fire Studio, designed and screen printed an amazing Pleasant Pops poster, featuring our emblematic Strawberry Ginger Lemonade pop bursting out of a blue and yellow etched background. In addition to making posters for bands both big and small (aka Jay Z), Anthony hosts printing workshops and has curated several print & poster shows. After running into Anthony last fall at a DC craft fair, upon noticing the Pleasant Pops print for sale, he told me it’s by far one of his most popular prints and he sells out of them regularly. We’re thrilled to have the limited edition poster for sale at the shop, rolled for easy transport, and ready to add a punch of color to any home. Finally, let me proudly recommend the Pop necklaces designed specifically for Pleasant Pops by Rachel Pfeffer, a DC based jeweler who is quirky, creative and, honestly, my best friend. Growing up, Rachel started indulging in crafty adventures early, making duct tape wallets, skirts out of old t-shirts, even a lounge chair made entirely of stuffed animals. However, she truly found her calling when she started making jewelry, taking after her father, a jeweler himself. With a focus on metal work and large, usually sparkly, stones, she has developed a unique design aesthetic. Her Pop necklaces are hand sculpted, made entirely of brass and hang on an 18”, gold plated chain. ...and enjoy seeing a new, and quickly developing, artsy side to DC!